Carabiners are versatile quick-connect snap hooks. The opening gate is spring-loaded, automatically snaps closed and features an interlock tooth. 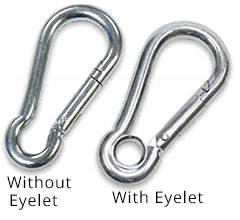 Use with Wire Rope Lanyards, Nylon Lanyards, rope or other tethering methods. Carabiners without eyelets afford easy attachment to lanyards, while Carabiners with eyelets keep the lanyard or other tether in place at the bottom of the Carabiner. Available from stock in steel with zinc plating and stainless steel.